It is spring in Texas, which means a few things. 1) It feels like summer, and we have already broken out the white trash inflatable pool and rubbed aloe vera on our first sunburns of the season. 2) I spent a good hour of my afternoon home sick, duck and covering in my hallway yesterday while a tornado tore up the neighborhood down the street. (sadly, I had a case of food poisoning so bad, I almost willingly walked out side). 4) My 1st grader's social studies unit on our state is in overdrive. Meaning I can’t say anything without him pointing out that it is the official state ___________. Apparently we have an official state mammal (the longhorn, to which I say boo), insect (monarch butterfly, to which I say fire ants would be more accurate) an official state dish ( chili, and suddenly I’m craving chili cheese fritos) an official state fruit ( grapefruit, what are we all 80?) and all kinds of other stuff I’ve never heard of even though I’ve lived here lots longer than he has. I swear he is making some of this up, such as the official Texas slurpee at QT that we should go try after school (red white and blue of course). Tess is even starting to join in and insisting that Justin “Beaver” is the official state singer, and that his newest single…is in deed written about her. So this afternoon as we headed out on errands, my son got excited and told me to look out my window. I thought he was going to point out another house covered in a giant blue tarp, which my heart couldn’t quite handle. My drive home the last two days has left me in tears taking in the damage. And realizing that these are my neighbors, not just people on CNN. And today, I even had to make my way through a police blockade just to get to the grocery store. 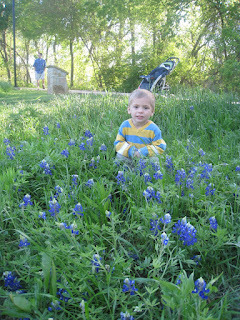 But instead, he said, with much enthusiasm, “Mom, look, bluebonnets! They are the official state flower." And then started droning on about the Alamo or something.” We have had this same conversation at least a dozen times just in the last few weeks because the sides of the roads are covered with bluebonnets and Indian paintbrushes and all kinds of other pretty. And I told myself, once more, that I needed to plop my kids in a field of them and get some snapshots before they are gone. I looked to see where Owen was referring to this time and noticed, that he was indeed right. There were a hundred or so bluebonnets out his rear passenger side window. But unlike, last week, they were much harder to see. The grass had started to grow up taller than they were. And now you had to kind of really look to notice them. Good thing nothing gets by my official state of Texas kid. I have some photographer friends and one of them used to do bluebonnet shoots. Her first year of this I helped her scout out a perfect location. She made flyers, sent emails and filled up all her timeslots. I happened to be at the same park she was planning on doing her photo shoot at the day before and had to call her with terrible news. The flowers were all still there. They were just covered up by lots of grass. My friend Rhonda didn’t know what to do. It was too late to find a new location and call everyone on her list. So instead she bought a pair of scissors. And got there really early. She literally spent at least an hour cutting individual blades of grass. By hand. Until she had enough flowers to get some decent shots. And when I looked out the window today, I literally pictured her back in that park, bent over, cutting grass with scissors. And to anyone that happened to walk or jog by that morning might have thought she was crazy. I probably thought she was too. But suddnely, I think maybe she had it right. Because too often we are quick to plow through what it is good. Or we let the grass take over. And we forget ourselves what is really there all along. And my God works like this. He is patient. He works one blade at a time to remove the stuff that isn’t beautiful. He uses scissors instead of a lawnmower as to not damage a single gift. Because underneath all that other stuff choking us out, might ust be something amazing. Well, that, and I’m pretty sure my son would bust him for chopping down even a single bluebonnet. (I don't know the person who made this video, but it is a student at the highschool of the town I live in....and all this damage was too close for comfort).